Bergamot marmalade is the best of all citrus marmalades. It is precious as it has the most aromatic flavour that you can ever imagine. In this recipe it is made with the leftover fruit mixed with some bergamot peel. But what is a bergamot? You may all have heard of Bergamot Earl Tea or the essential oil extracted from the peel of the bergamot. The origin of the bergamot (Citrus bergamia), in Greek “περγαμόντο = bergamonto” is a cross between a lemon Citrus limon and bitter orange Citrus aurantium, also known as Seville orange. In Greece, we love, love, love bergamots and we make Bergamot fruit preserve, bergamot marmalade from the whole fruit and bergamot liqueur. The bergamot is not edible as a fruit, as it is more sour than the lemon. You may wonder why we do not use the juice? Well, actually you can but in order to get the juice from 1 lemon, you will probably need 2 – 3 or even more bergamots and bergamots are quite expensive compared to lemons, so unless you produce bergamots and have a lot to spare, then it’s not affordable. When we bought the plot to build our house in Assini, it was full of mandarins and bitter oranges. However most of them were cut in order to build the house and only five of them were left in the garden. However, a couple of years after moving there, we grafted them, each tree to bear at least one or two other varieties. Each branch can be grafted into a separate fruit. So for example you can have one tree with a branch of mandarins, a branch of lemons, a branch or oranges and a branch of bergamots etc. We left a few braches with the local variety of mandarins, which are very aromatic and some with seville oranges. The rest, we grafted them into a different variety of mandarins (clementines), two varieties of oranges, one bearing fruit during the winter and one during the summer and of course, into bergamots. We have never sprayed our trees or vegetables, so everything coming from our garden is organic. Bitter oranges are also very aromatic and I love making it into marmalade, fruit preserve with the peel or whole before it matures and liqueur. This year, I even made blossom water and fruit preserve from the flowers. Like the bergamot, the fruit is not edible but only a few people know that it can be used in lieu of a lemon, since its juice is sour. Since it grows in abundance, I often use it’s juice instead of lemon and I love adding it to my lemony roasted potatoes which makes them even more delicious, giving them a wonderful aroma. Last year our tree gave us only two fruit. You can’t do much with only two fruit, so I combined it with other citrus fruit and made a Four Citrus Marmalade. This year the tree gave us 24 bergamots. In January, when we visited Assini, I picked all the fruit and brought them to Athens. My daughter loves bergamot fruit preserve and the years before, I always made two or three batches when in season. So this year, indisputably, she wanted all the fruit to be made into a preserve. To make the preserve, only the peel is used, so the fruit inside is usually thrown away. I don’t like throwing away anything that can be used, so in the past I attempted to make the leftover fruit into marmalade. As I said, the fruit is very sour, even more than lemons so I added more sugar than usual. The marmalade was delicious but even with the extra sugar added, the outcome was still more sour than one would like to eat a marmalade. My husband and I didn’t really mind as we love anything sour but my children didn’t like it. The next year I made it again, this time combining it with other fruit. I used apples and pears and it worked just fine, but it was just another jam with bergamot flavour. This year all the fruit from our tree was used to make the fruit preserve. I’ve kept some zest in the deep freezer to flavour cakes and with the remaing zest I am making a liqueur. I had two kilos of leftover fruit, which was a pity to throw away, so this year I kept the peeled fruit a couple days in the fridge until the fruit preserve was done. My idea was to make the marmalade, combining it with the fruit preserve. The procedure is quite tedious but worth all the effort. After removing the fruit to make the preserve, the interior is left with a lot of pith, lots of seeds inside and membranes. All this has to be removed and this takes some time. After removing all the pith, seeds etc. I now had 730 grams of clean fruit. So, I made the marmalade as I did the first time using just the cleaned fruit, sugar, a little bit of water and to flavour it I added some geranium leaves. At the beginning you mix it until the sugar dissolves and boil it for fifteen minutes. You must not leave it unattended as it bubbles and it may overflow. I usually leave the wooden spoon inside the pot, which helps not to spill on the stove top. When making marmalades, they never set until they cool. My thermometre is in Assini, so I use the other method of making jams or marmalades, used before the thermometre era. If using a thermometre, just skip the following steps and boil it until it reaches 105 degrees Centigrade (220F) . So, without the thermometre, the best thing to do, is to cook if for fifteen minutes and wait until the next day. If it does not set, boil it for another five minutes and leave it again to cool. Repeat this procedure until it sets. Since I made this marmalade before I knew that it needed ten more minutes, so I skipped one of the waiting times. 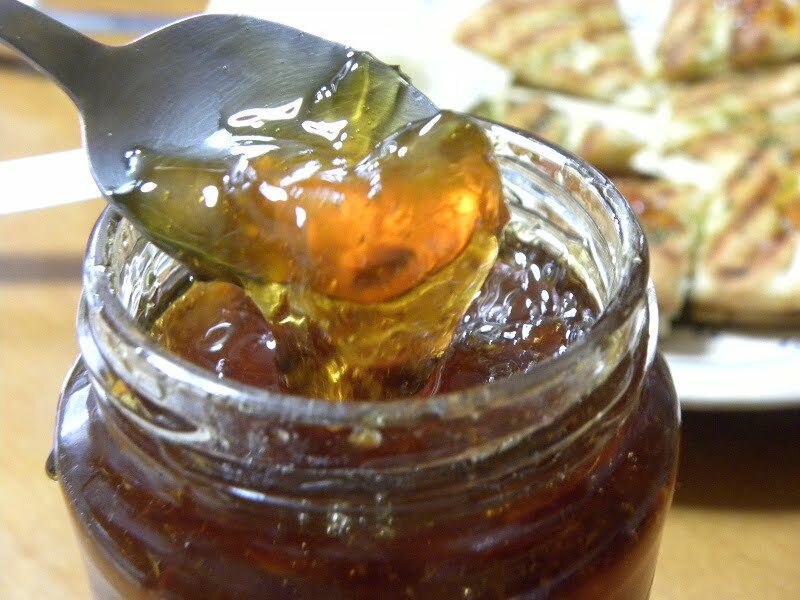 During the second time of boiling, I cut six pieces (from two whole fruit) of the fruit preserve into thin and small pieces and mixed it in the marmalade. The experiment was successful, as the sweet peel balances the sour taste of the marmalade giving it a sweet and sour taste, full of aroma. For the past month, we have been enjoying our breakfast or a snack every day with homemade pita chips, topped with this amazing marmalade and delicious graviera cheese from Crete. At the end of making fruit preserves or marmalades, we usually add some lemon juice so that the sugar does not crystalize. In this case, no lemon is added, as the bergamot does the same job. Next year, hopefully our bergamot will bear more fruit and I will make the marmalade using the whole fruit. 6 bergamot fruit preserves cut into thin, small pieces. Wash the bergamots and let them drain. Grate a thin layer of zest from each fruit. (For this recipe the peel is used to make the fruit preserve). Open each slice of bergamot, remove the seeds and the membrane and take only the fruit. Add the sugar and water and set aside until the sugar dissolves. Add the fragrant geranium leaves and simmer for fifteen minutes. When the sugar dissolves put it on the heat and boil. Caution as the marmalade will bubble and may overflow. In this case, remove it from the heat for a few seconds and when it settles, continue simmering for 15 minutes. Set aside and let it cool completely. When it cools, if it has not set, repeat boiling for ten more minutes, let it cool and check again if it has set. If not, repeat the same procedure boiling it for five more minutes. Cut the bergamot fruit preserve into small and thin pieces. Add the bergamot preserve in the marmalade and mix.